Christiane Bettens* –also known as Mélisande, created this gorgeous modular origami piece as an Advent Wreath. Made with green and red paper, this origami wreath is perfect for the Christmas season. But if we use orange and yellow colors, it becomes a radiant sun. Just what we look forward to have at this time in the late northern winter. Something that caught my attention about this model is that the module for the wreath is Christiane’s brilliant use of the bird base, which is the same base used to make the traditional crane and the flapping bird. Being able to spot this remarkable new possibility is origami creativity in action, an invitation to wonder and explore what other creations are hiding within these familiar folds. Today, March 14th (3.14) is known as Pi day. There couldn’t be a more appropriate day to make a circular origami piece. 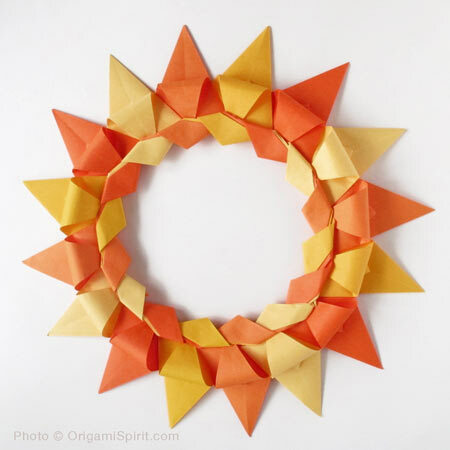 Here are video instructions to make the origami advent wreath. WARNING: Once you see the video you’ll to want to fold this wreath right away! For a wreath 12 inches in diameter you’ll need sixteen square pieces of paper measuring 6 x 6 inches (15 x 15 cm). Use thin paper such Kami. Clips or clothes pins help to hold the modules in place during assembly. If you need to handle these origami wreath a lot, or give it away as a present, put a drop of glue at the tip of each module to prevent them from coming undone. One of these wreaths, colored red and green, was the center piece of a group of origami rings I placed at the entrance of my house as a decoration this Christmas. It looked so lovely that I decided to leave the arrangement on the wall but have replaced it with a newer version in yellow and orange tones for the spring season. *Christiane Bettens has been making and creating origami since 2003. She is interested in designing and exchanging ideas on abstract, geometrical origami such as boxes, modular pieces, and tessellations. Christiane’s prolific origami work can be admired on her Flikr page and her own blog. Thank you to Christiane for granting permission to feature her Advent Wreath on Origami Spirit! Leyla, it is a wonderful handmade decoration! I love your creation of the nativity set. I still love them so dearly.Thank you so much. You made it, Virginia, beautiful! Thank you for sharing your photo and your post. Excellent! I am learning so much an enjoying every post. Thank you. Que cosa mas Bella, Ud. tiene un corazon muy Geande, en ser tan generorsa, a darnos a nosotros sus projectros, de sus creaciones. Qua amabel es Ud. tambien! Que cosa tan Buena a tener un Papa Que es representante de Sur America, aun que Elmismo es Itiaiano, de parte de sus Padres. Buenas cosas Ohala van a pasar Buenas para todos en este Mundo. Muchas Gracias, por lo visto sus creaciones son ejemplo de quen es Ud…muy Bella! ¡Felicitaciones, Leyla, por tu dedicación respetuosa, prolija, didáctica, al plegado y a los plegadores que conquistas! Soy docente y te aplaudo. Next post: Useful Origami, Adding Happiness to Your Life!